Microsoft Graph provides a unified programmability model that you can use to build apps for organizations and consumers that interact with the data of millions of users. You can use the Microsoft Graph REST APIs to access data in Azure Active Directory, Office 365 services, Enterprise Mobility and Security services, Windows 10 services, Dynamics 365, and more. Explore our documentation to learn more about how to use Microsoft Graph APIs. Find out what you can do with Microsoft Graph and see some popular API use cases. 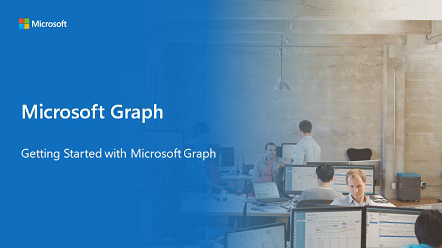 Get familiar with the major services and features that are available in Microsoft Graph. Make requests and see responses against Microsoft Graph. Find out how to start using the Microsoft Graph API to access Microsoft Cloud service resources. Use the Microsoft Graph REST API v1.0 to meet your practical production needs. Try out the Microsoft Graph beta endpoint. Find SDKs and follow platform-specific, step-by-step training exercises that guide you through basic Microsoft Graph concepts, including how to create a simple app that uses Azure AD authentication and accesses data via Microsoft Graph. Find out what’s changed in the v1.0 and beta versions of the Microsoft Graph API. Read the blog to get the latest news about new APIs, breaking changes, and more. Learn about known issues with Microsoft Graph.